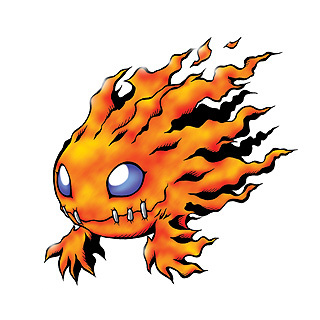 A Digimon that evolved from Mokumon, its entire body is ablaze due to how its Digicore burns fiercely for a body of its size. It has a wild temperament for its small size, causing its Digicore to burn intensely, but it cannot fight properly despite its aggressive personality as its offensive power is still low. Not only that, it is extremely weak to water and Ice-Snow type Digimon, so it will flee the moment it encounters them. Incidentally, any relation between it and Meramon has not yet been made clear. It attacks opponents with small bullets of fire shot out of its mouth, but they aren't very powerful. 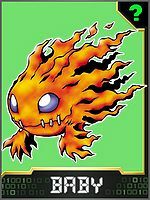 A Flame Digimon that evolved from Mokumon, its entire body is ablaze due to how its Digicore burns fiercely in the heart of its small body. It has a fierce, aggressive personality atypical of small Digimon, and will spit out small bullets of fire from its mouth to threaten any enemy it encounters. However, its offensive power is still low, so it seems to be unable to take on grown Digimon as of yet. Not only that, it is by nature extremely weak to water and Ice-Snow type Digimon, so it will flee the moment it encounters them. Incidentally, any interesting relation between it and Meramon has not yet been made clear. However, there are believed to be similarities between them judging by their names and appearances, so further updates can be expected from Digimon researchers. | Peti is short for petit 「プチ Puchi」 meaning "small"
| Mera comes from meramera means burning in Japanese. 3.1.3 Digimon Savers 3D: The Digital World in Imminent Danger! Spits out a ball of flame. Three Petit Meramon merged into one and evolved to a Meramon when attacked with Agumon's Baby Burner. Peti Meramon appears as an unobtainable Digimon NPC in Digimon World, making a brief appearance. 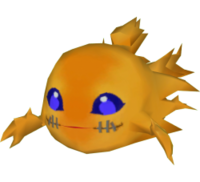 Several Peti Meramon reside in the Lava Cave's moat, accessible after defeating and recruiting Meramon, where they'll act friendly and will simply greet the Player when talking to them. During the end of the moat, there's a chamber where a Peti Meramon will trade either Peti Meramon or Meramon Cards for the price of 500 BITs. Peti Meramon is available as a Digimon Medal. Evolves from Mokumon. Can evolve to Bakumon, Candmon or Pico Devimon. ↑ Digimon Savers: "Genius Thoma has Returned! Beat Meramon"
This page was last modified on 13 March 2019, at 22:55.